APECA Peru provides unusual opportunities to learn and to conduct research in a natural, undeveloped setting. The possibility is open to undergraduate and graduate students, faculty, and professionals. 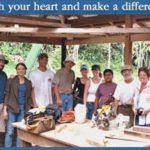 In addition, anyone who wants to learn first-hand about a beautiful, fascinating region and its inhabitants can experience the Amazon rain forest while doing useful work. Please understand that the purpose is support of APECA’s ongoing projects in health, education, and conservation; it is not ecotourism. Participants are welcome in the program for periods from two weeks to several months. Fees are charged to cover room, board, and local transportation costs. Personal travel expenses are the responsibility of each participant. To be accepted as a participant, each applicant must complete a thorough application. Students: Undergraduate and graduate students, who will receive academic credit for their work, may undertake projects which are compatible with APECA projects. They may participate with local staff in project activities. Spoken Spanish is a requirement. General visitors: Everyone who wishes to help achieve APECA objectives is welcome to take part in daily activities at El Fundo and assist on APECA field projects in river villages. Minimal spoken Spanish is a requirement. Independent Researchers: Faculty, doctoral candidates, and working professionals who want to conduct research, which has been determined by APECA staff to be compatible with its projects, are welcome. Researchers will be asked to provide copies or summaries of their work to APECA. El Fundo, APECA’s field base and training center, is close to the district administrative seat, Tamshiyacu. Our base is on the south bank of the Amazon River about five hours by public motor-taxi boat south (upstream) of Iquitos, the capital of Peru’s northeastern region, Loreto. Travel in APECA’s boat takes less time, about 2 hours. Life at El Fundo is simple, uncluttered, and rustic. Limited amounts of electricity are provided by solar panels and a generator. The sleeping facility, which overlooks the Amazon River, is a comfortable open space with cement floor and screened windows. There is limited solar power at night for lighting. Beds are equipped with mosquito nets. Bathrooms include flush toilets and showers. The dining room, kitchen and conference area are fully screened. Applicants must be 18 years or older, in good health, and interested in the study and practice of rain forest and cultural conservation, village development, health services, or similar activities relevant to APECA’s mission. And they must complete the necessary application form. Field work requires competence in spoken Spanish, as villagers speak no English, and APECA provides interpreters only in exceptional circumstances.